You are here: Home / Christian Talk / The Top Ten Reasons Men Have Stopped Attending Church. The Top Ten Reasons Men Have Stopped Attending Church. (ThyBlackMan.com) In April of 2018, I wrote an article for this publication entitled, Adam, Where Are You: Why Black Men Have Quit the Church. 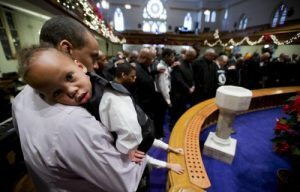 That article pointed to four major rationales for why brothers have stopped attending church weekly, including too much judgment in today’s churches, the rise of personal spirituality, the church offer no impactful ministries for black men and other religious entities have offered more resonance (including Islam). Today, I’d like to expand on the list of reasons as to the decline of weekly church attendance among our men. It’s an important topic because for so long the black church was the epicenter of religious and communal life and was also the linchpin for activism for peace and justice. With the collapse of our male worshippers, we have witnessed corresponding erosion in our families and communities, in particular the presence of qualified role models for our young black boys. Make no mistake: the invisibility of the black male in our religious and communal life as African Americans has had catastrophic effects in other parts of our community. It is not the intent of this brief article to exhaustively treat each of the ensuing rationales for why black men don’t go to church, but rather to spur dialogue and, hopefully, act to reverse the trend. Overall, church attendance has been on a steady decline for the past twenty-five years across most denominational lines, but is a quite succinct phenomenon in the black Protestant tradition, mostly among Baptists and Methodists. With the male population, though, it’s a huge issue. Recent studies, for example, point to the sobering reality that, although more than 90 percent of American men believe in God, and five out of six identify as “Christian”, just 35 percent of the men in the United States say they attend church weekly. A Pew Research survey shows that black men are more likely to be religiously “unaffiliated” than women (22% vs. 14%). So why have our men stopped attending church? Who’s to blame? The men themselves or church leadership? It is likely a combination of both. Before we answer that question, though, let’s put it out there. For every individual male who made the conscious decision to stop going to church, that decision was not made in a vacuum. It came as a result of a confluence of events and experiences, including but not limited to, upbringing, socialization, consciousness, personal circumstances, demographic changes, personal growth, the economy, spiritual maturity etc. Obviously, more germane reasons – such as working on Sunday – contribute to the decline of male attendance at weekly worship. One: men tend to indulge in stereotypical arguments regarding the pastor which leads to disenchantment; things such as how much money the preacher is making, driving expensive cars, sleeping with female parishioners etc. Two: men tend to believe the Holy Bible to be the “white man’s” book. Three: men tend to believe Christianity to be the “white man’s” religion. Four: men have become more pluralistic in their world perspective and see less need for “religion”. Five: men may have had run-ins or disagreements with the pastor or lay leader over church doctrine. Seven: men have trouble submitting to male authority and have a problem with women as leaders or pastors. Eight: men have become turned off by traditionalism (the “ole one hundreds”). Nine: social media and online churches offer alternatives to traditional worship and liturgy. Ten: the rise of non-denominationalism offers alternatives for contemporary and doctrine worship. There may be other reasons that were not listed above, but the bottom line is this: we must act now to reverse the trend of our brothers quitting the church or our communities will continue to extract a heavy penalty. What abut those of us who have discovered false teachers, pulpit pimps and false doctrines flowing from the pulpit that seek to manipulate and control the men and often the women? Why Indigenous man is leaving the 501C3 church….4 the same reason Economics Impowerment wasn’t 1 of the 10 reasons for us to turn our backs on this Castrating Institution…501C3 Puppet…..